23.45° Axial Inclination - that's the reason for the season. The earth's axis is tilted 23.45° from the plane on which it orbits. This tilt is for the most part constant as it orbits the sun. That gives us four seasons as each hemisphere alternates between being angled towards or away from the sun. Jesus is the reason for Christianity, but winter solstice celebrations are ubiquitous across nearly all cultures and religions. I don't know why I feel the need to point this out, but I suspect it has something to do with the apparent increasingly outspoken Christian voice here in the Southeastern United States. "Remember the reason for the season!" they keep telling me. So, okay. I did. This month's issue of Make Magazine (12) had a short article titled "Shoot the Stars: Astrophotography with your digital SLR." I have always had an interest in astronomy, but I hadn't really considered just pointing my existing DSLR setup at the night sky without a telescope, tracking system, &etc. But, as it turns out, a good CCD imager like the one in my Canon Digital Rebel XT is all you really need to start taking some neat pictures of the night sky! As a test I took the following images from the alley behind my house in downtown Atlanta, under a severe amount of light pollution. I've just scratched the surface of astrophotography once before with my father's Celestron scope and an Orion digital imager, and learned then that having good post-processing software is half the battle. After doing some searching, I decided to give the freeware DeepSkyStacker a spin. 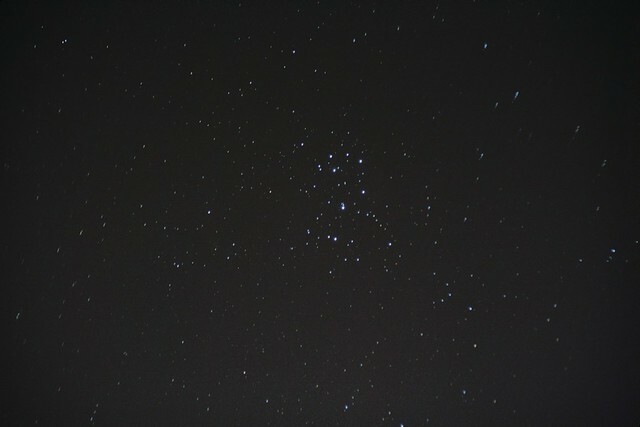 My first target was the Pleiades (M45), as they're relatively easy to spot in the night sky and rose early. I equipped my Canon with my Sigma 70-300mm f/5.6 zoom lens and set it up on the tripod. I took a series of exposures in increasing increments of time until the stars were noticeably blurry when zoomed in, and then backed off one. 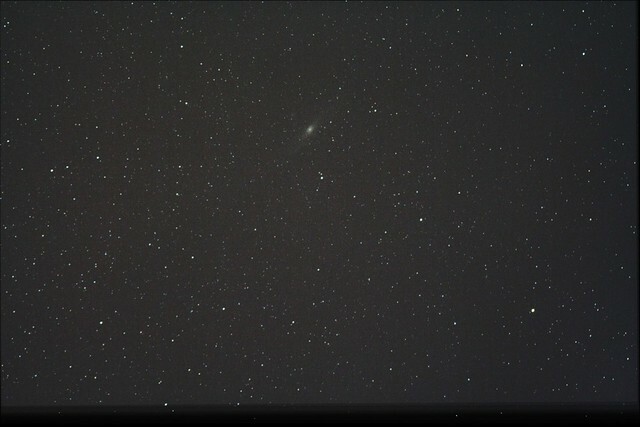 The following is a composite of about 35 exposures at 4 seconds each. Focal length: 165mm. Next, I got ambitious. 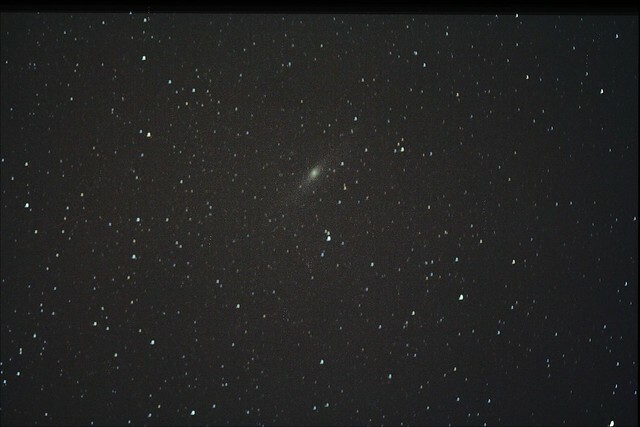 I knew the Andromeda Galaxy was directly overhead, about half-way between Cassiopeia and the half-moon. I scanned the sky visually for a few minutes, but the light pollution was such that there weren't really even any stars visible in the general vicinity of the great galaxy. On a lark, I pulled the focal length all the way back to 70mm and pointed the camera straight up. I took a 30 second exposure, and then zoomed in and panned around the thumbnail on the camera display. There it was, a cotton-like disc on the left-center region. So, I panned left and repeated until the galaxy was essentially centered. I'm sufficiently impressed. Next I'm going to have to take the camera out to a dark sky somewhere and do some "real" exposures to see what I come up with!